I know that a lot of people are saying that 2019 is the year of the low buy and while I am not personally setting a monthly budget, I am trying to be more mindful of my purchases. In 2018, there were some months where nothing caught my eye and others where a number of products did - this is why I wouldn't set a monthly figure because I actually find it easy not to buy anything some months. 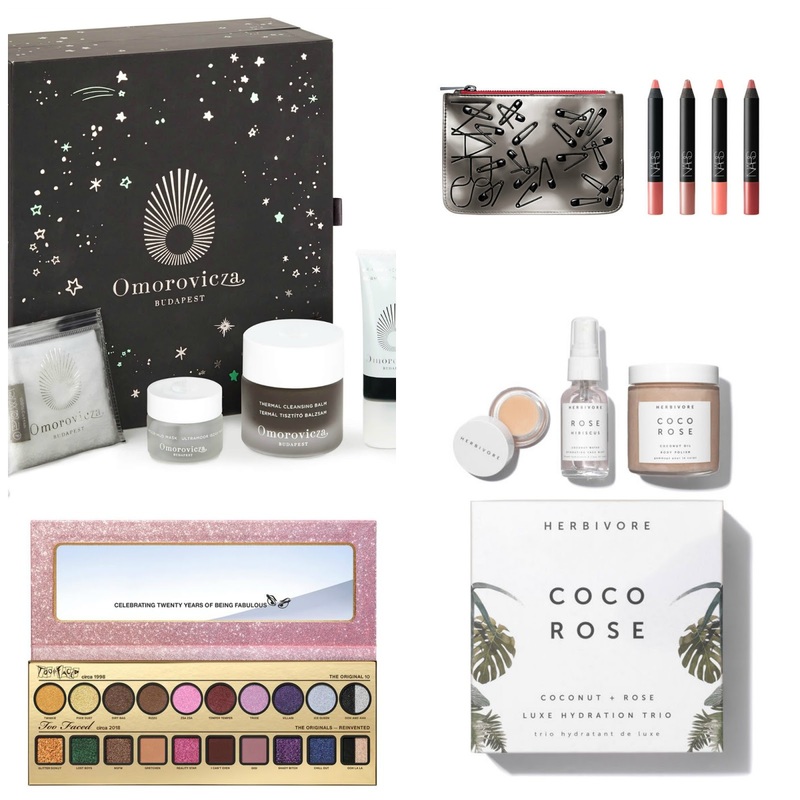 That being said, for beauty lovers it isn't easy to go on a 'beauty diet' so if you do feel like treating yourself, I have a round up of the best of what's left in the sales to share with you. Nars Ransom Velvet Matte Lip Pencil Set: I spoke about my love of Nars Velvet Matte Lip Pencils in this post last month. They are so comfortable and long-lasting on the lips. This set is a bargain at £24 for 4 pencils and a pouch. Dr Dennis Gross Dew Holiday Right: This set is worth £124 and is on sale for £49. It contains a cleanser, eye cream, moisturiser and 14 Alpha Beta Peels, which are some of my favourite skincare products. They are brilliant for textured, porous or dull skin. Review here. Tata Harper The Glow Getter: This is one I have my eye on because Tata Harper is a brand I want to try more from. It contains a 50ml Regenerating Cleanser and 15ml Resurfacing Mask. I have tried the mask before and it exfoliates without stripping the skin to reveal smooth and soft skin. Worth £65 and on sale for £29. Herbivore Coco Luxe Hydration Trio: Another set that I very tempted to buy, this contains a body polish, a lip conditioner and a hydrating face mist. This set is worth £50 and is on sale for £18. Pixi Fairy Lights: I have raved about these liquid glittery eyeshadows a few times on the blog (post here) - they are pigmented, sparkly and feel cooling on the lid. They are also flattering even on those who think they may not suit glittery eyes. Reduced from £15 to £9. Becca Anti Fatigue Under Eye Primer: I want to buy this after reading Toni's post on how she uses it to prevent her concealer from creasing. I've never tried an under eye primer before! Reduced from £24 to £12. Too Faced Then & Now Eyeshadow Palette: I am a massive fan of Too Faced eyeshadows - they are pigmented, creamy in texture, easy to work with and long-lasting on the lid. See post here. If you haven't tried Too Faced shadows, this would be the perfect place to start! Reduced from £52 to £34.58. Jouer Lucky & Luminous Créme Highlighter Palette: I'm very tempted to buy this because I love creme highlighters and I love the single Jouer highlighter that I already own. Reduced from £31 ro £21.70. Omorovicza Moor Mud Set: This set was already amazing value at £55 because it contains a full size thermal Cleansing Balm, a deluxe mini Refining Facial Polisher, a mini Ultra Moor Mud Mask and a mini facial mitt. Review here. Worth £84, currently reduced to £38.50. They also have a Christmas Intro Set, which contains 5 products with a value of £112, reduced to £45.50. By Terry Sun Designer Palette: This palette combines bronzer, blushers and highlighters that could also be worn as eyeshadows. The formula of these powders is beautiful - pigmented, creamy and easy to work with. Reduced to £37. Emma Hardie Glow On The Go Kit: This set contains a full size Plump & Glow Hydrating Facial Mist and a 30ml Protect & Prime. RRP is £69.60 and it's reduced to £36. Lime Crime Venus Palette 3: I reviewed this palette here last year. I love the shade selection and formula of the shadows. Reduced from £34 to £20.60. Tiffany & Co. Eau De Parfum 75ml Gift Set: A stunning, sparkling feminine scent in unique packaging! I love this perfume. Reduced from £115 to £69. YSL Touche Éclat Collector Edition: I have repurchased this repeatedly for around 19 years. It brightens the under eye area and, depending on the shade, can also be used as a subtle highlighter. Reduced from £25.50 to £19.10. There are still lots of bargains to be had but these are my top picks! Have you bought much in the sales? I'd love to hear!